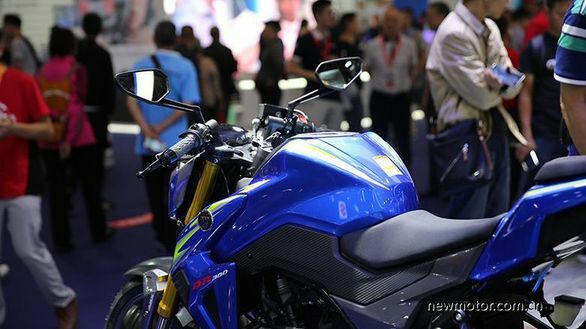 Suzuki's Chinese partner, Haojue has showcased its upcoming 300cc naked streetbike, called the DR300 at the Chongqing Mobo Fair in China. As reported earlier, this is the very motorcycle that could be christened as the Suzuki GSX-S300 and also go on sale in other markets, including India. 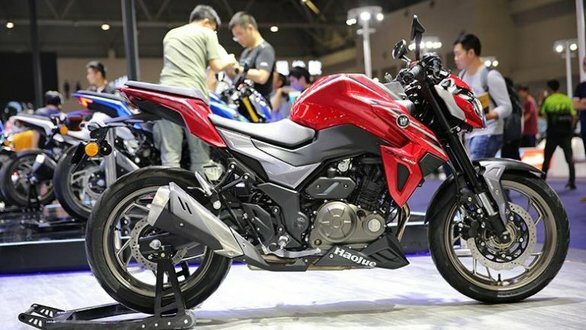 The fact that Haojue already manufactures the GW250 aka the Suzuki Inazuma, the GSX-250R and the V-Strom 250 for Suzuki in China makes the belief stronger. Then there's the fact that the design of the DR300 shows similarities to some of Suzuki's designs, particularly the aforementioned quarter-litre motorcycles, not to forget the inspiration from the Suzuki GSX-S1000's styling. The DR300 uses upside-down forks for a beefy appearance, along with a large fuel tank with extensions, as is the norm with most streetbikes currently, while the engine is held closely underneath. The bike displayed was shod with a 110-section tyre upfront and a 140-section at the rear, both Pirellis. The DR300 uses a pair of clip-on handlebars along with a stepped seat, so maybe, just maybe, the bike might spawn a fully-faired version in future. If and when that happens, it should be interesting, considering how things have heated up in the quarter-litre sportsbike space in recent years, thanks to a slew of launches like the KTM 390 Duke, the Kawasaki Ninja 300 and Kawasaki Ninja 400 both, the Yamaha YZF-R3, the Honda CBR250R as also the Honda CBR300R. For the record, the Haojue DR300 is powered by a brand-new 298cc, liquid-cooled single-cylinder engine with a four valve head that is mated to a six-speed transmission, though power and torque figures have not been revealed. All said and done, it appears that Suzuki is set to join the quarter-litre streetbike and sportsbike party!